April seemed to be a quiet month and didn’t bring any particularly interesting items but I’ve managed to find a few to write about. 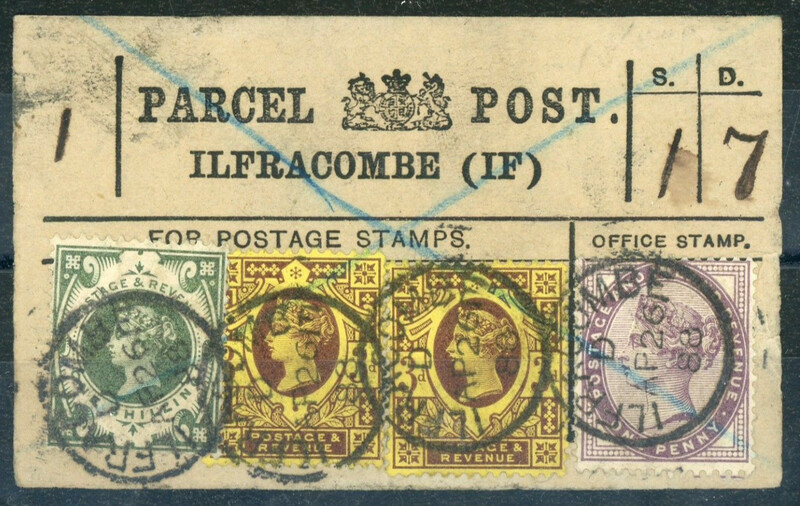 First up is an attractive parcel post label sent registered from Ilfracombe with a reasonably high franking of 1s7d, which sold for £81.76. 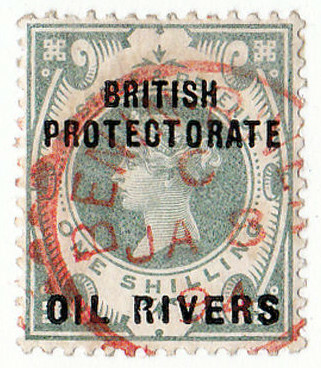 This Niger Coast Oil Rivers 1s green has a neat Benin River cds in red, but what is of more interest is the break in the first “R” of “RIVERS”. Whether it is constant or not I’m not sure. I’m currently a member of the GB Overprint Society, but have a backlog of journals to go through to glean more information on the overprints on Jubilee stamps. It sold for £27.25. This stamp was a bit of a surprise at how much it realised. Obviously the “TATI / BECHUANALAND” cancel is scarcer than I realised. It realised £123. 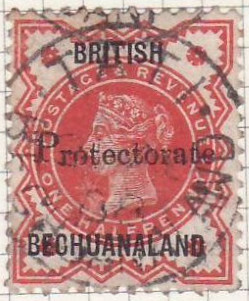 Another item of cancellation interest is the cover below with a machine cancellation. Not the scarcest type by any means, but it sold for a solid £35.65. 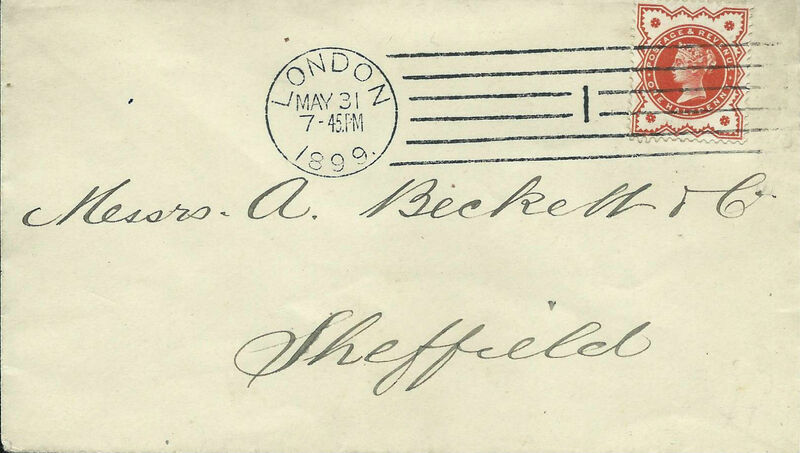 And finally only 1 bidder was interested in the cover at the bottom at£25.74. 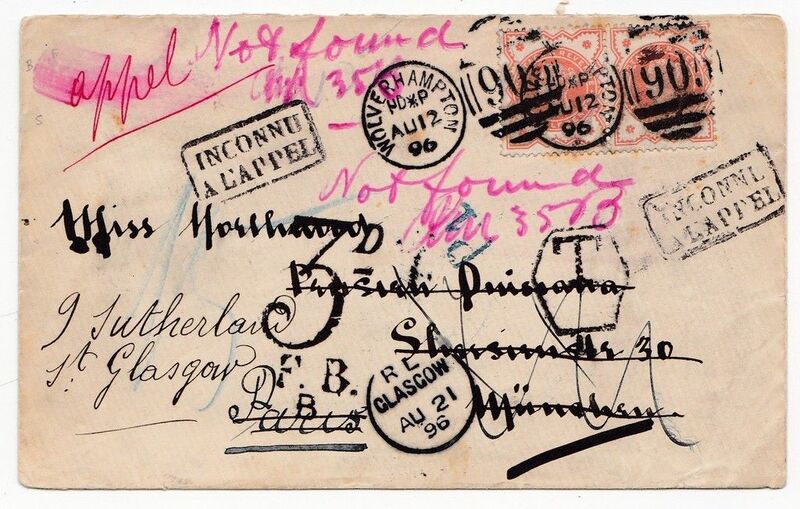 Sent underpaid by 1 1/2d, it was sent to Munich then redirected to Paris before being sent to Glasgow. The colours in the 1/2d vermilion are slightly faded which put me off, but a collectable item nonetheless. We start off this months retail highlights with a very important reference for every Jubilee collector. 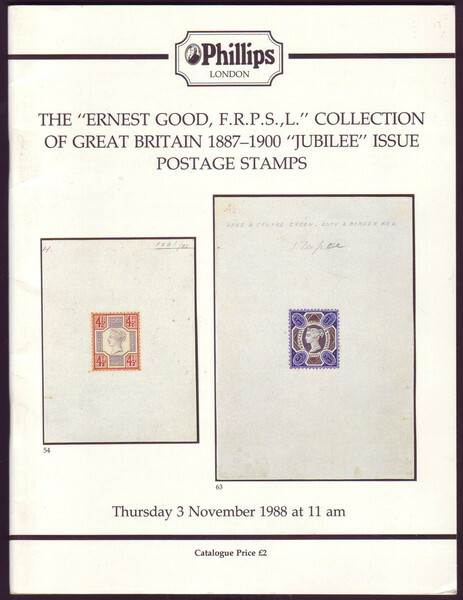 The Ernest Good Collection auction catalogue by Phillips on 3rd November 1988 is still one of the best collections of the Jubilee issue ever formed. Sold by Bill Barrell for £12.50. Next up is the cover which, as they say in the business, is full of character! This is normally the code word for scruffy, and it’s hard to deny it in this case, but look beyond that and you’ll find an extremely interesting cover. Sent to New Zealand, it was simply addressed to “J. 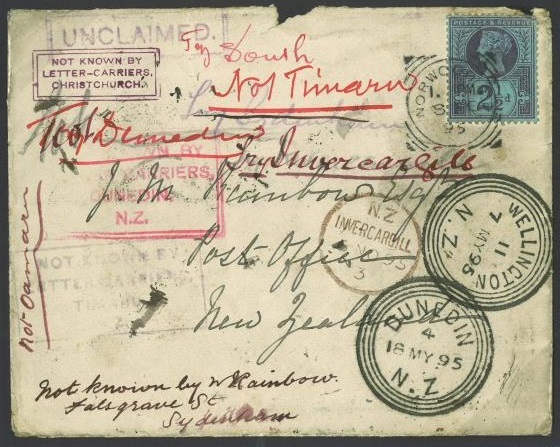 M. Rainbow, Post Office, New Zealand”! What is equally amazing is that the New Zealand still tried their best to deliver it. With transit markings from Christchurch, Dunedin, Wellington, Invercargill and Timaru. Yours for £155 from Samwells. 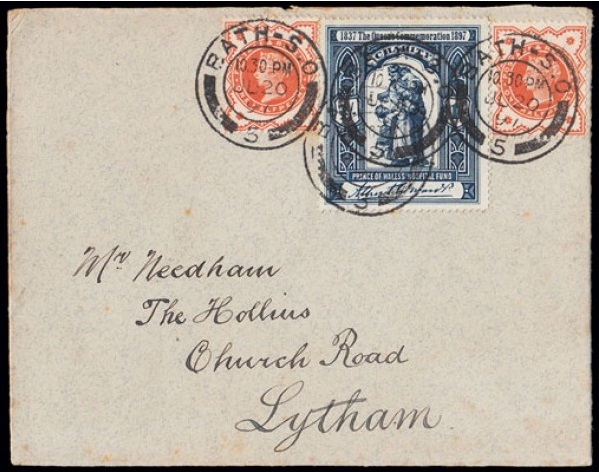 And to finish with we have a scarce usage of the 1897 1s Prince Wales Hospital Fund label on cover with two 1/2d vermilions. For sale by Andrew Lajer for £165.